La Cigale (The Cicada) is the symbol of the south of France. It represents welcome and good fortune. And this is what we do best by inviting all ages and nationalities to our beautifully restored colonial house located in the heart of Cuenca's UNESCO World Heritage Listing. We provide attractive 4 and 6 bed shared, twin, triple and double (matrimonial) rooms with ensuite bathrooms. All include towels, soap, WiFi/internet, power outlets, comfortable mattresses and extra blankets. Rooms and bathrooms are cleaned every day and we make your bed! All rooms (except $6 shared) include a served breakfast in our excellent restaurant from 8am to 10am. Our popular bar provides a great atmosphere by candlelight and good tunes every night until 23:30. Happy Hour drinks are from 4pm to 8pm, and board games and cards to rent for free. We also have a chill out area with a hammock. Clean and simple accommodations. We got exactly what we were expecting. 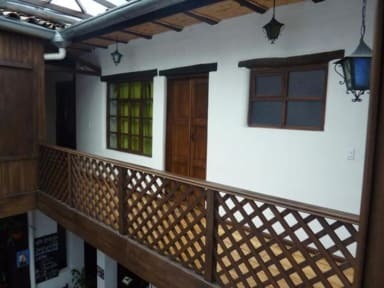 Close to the major attractions in colonial Cuenca. The restaurant at the front of the property is loud up until midnight or so, but that was not a big issue for us. The staff was responsive, but if you are a high maintenance traveler, you might want to look elsewhere. 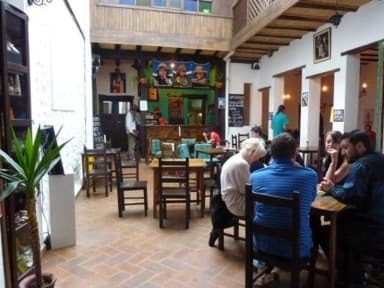 Located in the party area of Cuenca, it is a great spot to get out and meet people up and be close to the party. The location is really nice and is also part of a very nice restaurant. The only downside is the lack of security as its pretty easy to walk into any room (however, the city is pretty safe itself). I also would not recommend if you are a person who likes to sleep early, as the music is on quite late! Nice location. You have to ask if you want hot water. There are many locals in the bar/restaurant. If you don't speak Spanish you might feel lost. The bar is the common room so meeting up with fellow travelers is difficult. There is no kitchen where you can prepare your own food. Laid back hostel with friendly staff, room was very noisy as predicted but we were tired, so fell asleep with ear plugs listening to audiobooks. Staff were helpful. It was a little pricey for what it was, distinct lack of hot water, slightly tired rooms and variable wireless access in the bedroom. However, it felt like a safe place to be on my first 2 nights in Cuenca and has easy access to the centre and riverside walks. Nice eggs for breakfast.